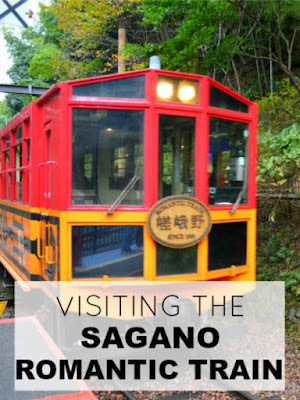 We make our way from the Bamboo Forest to Torokko Arashiyama station, where the Sagano Romantic Train will depart from and make our way to Kameoka Torokko station. We get here early and purchase our tickets, which costs us just under 1000 Yen for the two of us. We are able to book a seat on the open carriage, but it quickly sells out after us and then there are standing room only tickets left. 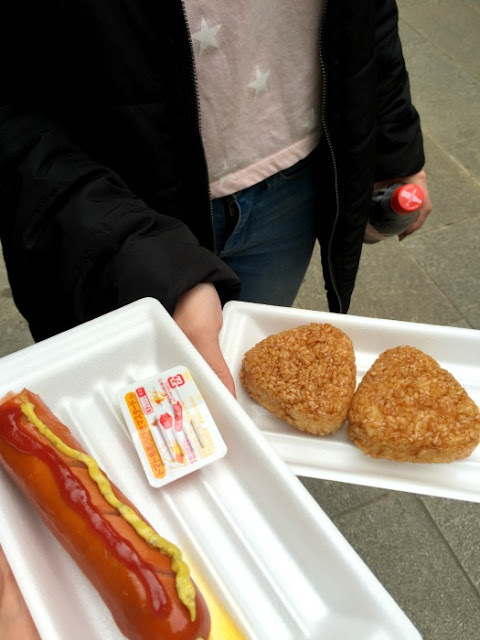 We decide to wait the time out by browsing the gift store and buying some lunch. 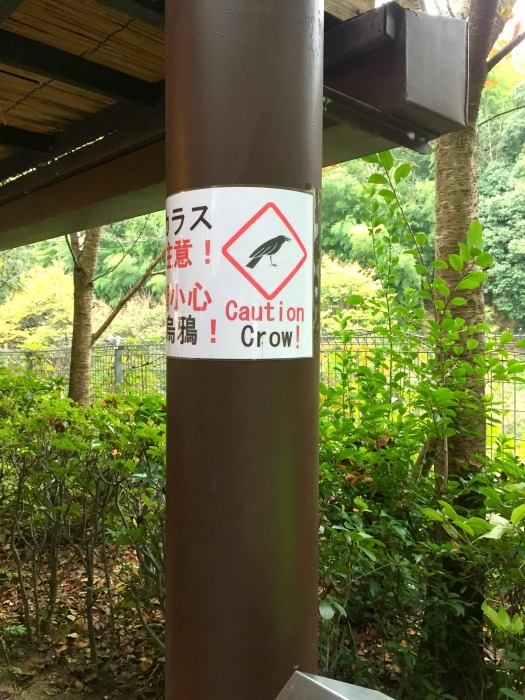 We have a good giggle at the Caution Crow sign, crows seem so tame to us in comparison to magpies! 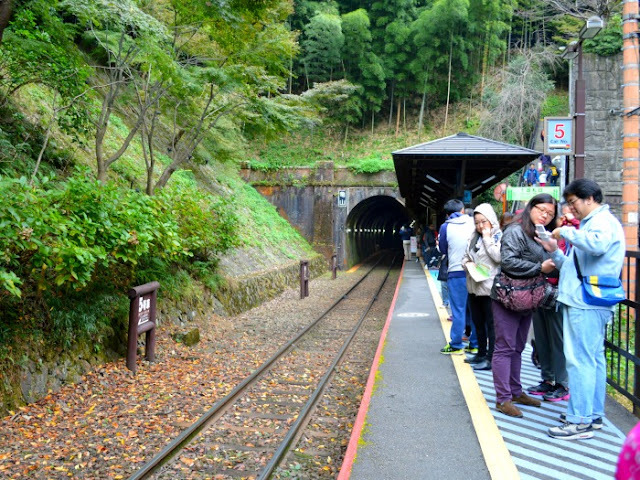 When it’s almost time for the train to arrive, we are allowed down onto the platform. The train arrives at the platform and everyone is so efficient at getting on the train. We settle in and the trip begins. Not long into the train ride, it starts to rain! Surprisingly we don’t get wet as there is some shelter. 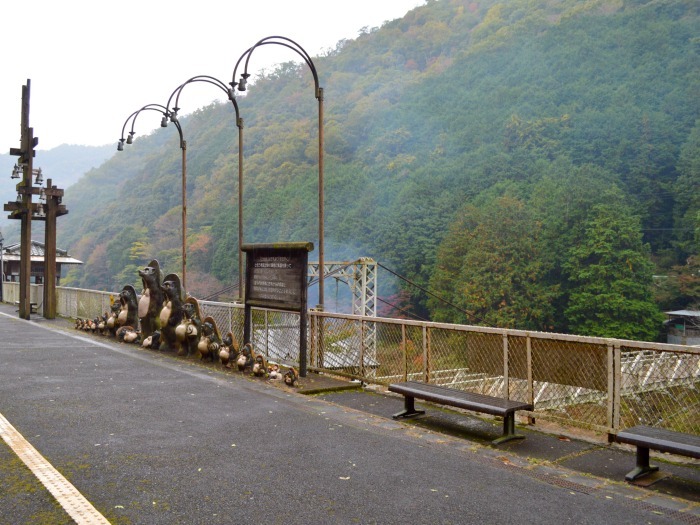 The scenery is amazing and I’m quite disappointed with the way my photos turned out as it doesn’t do the trip justice. 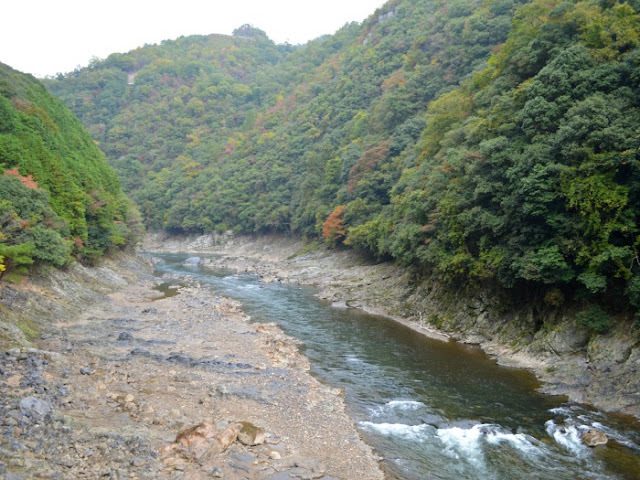 We stop briefly at Torokko Hodukyo Station, but I’m not sure why as there appears to be absolutely nothing here, except for a bridge across the river into the wilderness. Oh look, here’s Kate and I. The lovely couple across from us took this photo as we’d taken one for them. I wish this photo showed the true colour of the water. It’s was beautiful and aqua. So pretty! You can catch one of these boats back, but Kate gets motion sickness quite easily, so I wasn’t going to chance it! After we disembark at Kameoka Torokko station it is raining quite heavily. 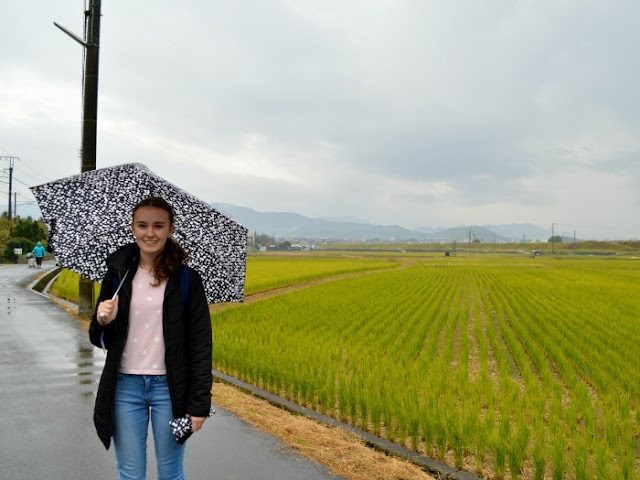 Luckily for us the gift shop are selling umbrellas as there’s a 10 minute walk to the JR Umahori station to get back to Arashiyama. 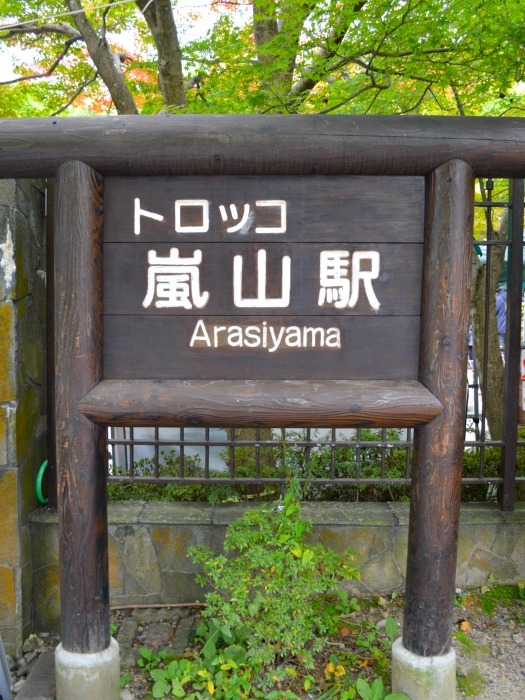 We get back to Arashiyama and then make our way towards Arashiyama Monkey Park Iwatayama. Seems like a nice train to go on. Loving the riverside views. If I ever get to this area, I would consider taking a ride on it. 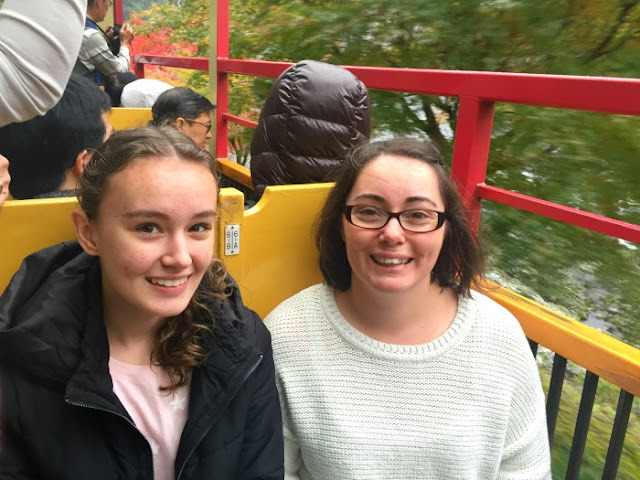 I hope you do get there Danik, Kyoto is amazing and there's so much to see and do! Sometimes pictures are just not close enough to the real thing. But the good thing is that you loved the journey and that's what matters. Exactly! I can still picture the aqua of the water in my mind, so at least I still have that too! that's a cute train! it's always great when you get amazing scenery on a journey too! It was so cute! Absolutely packed, but cute also! Looks like a lovely little outing. 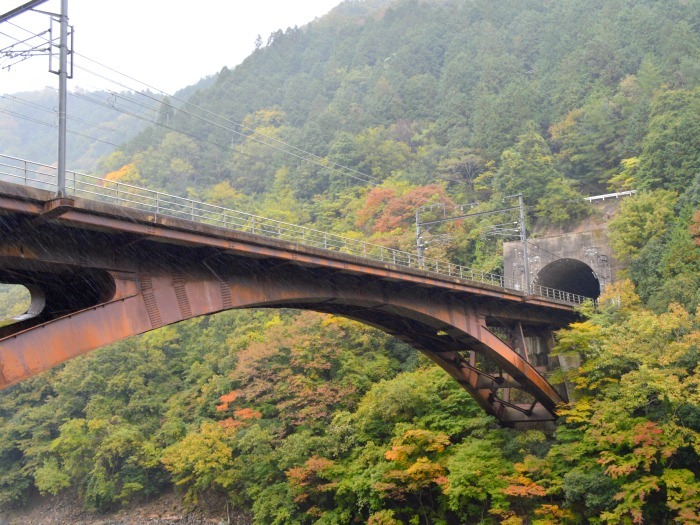 I imagine it would be very pretty in the peak of Autumn. It was beautiful. And a nice way to see another part of the area. 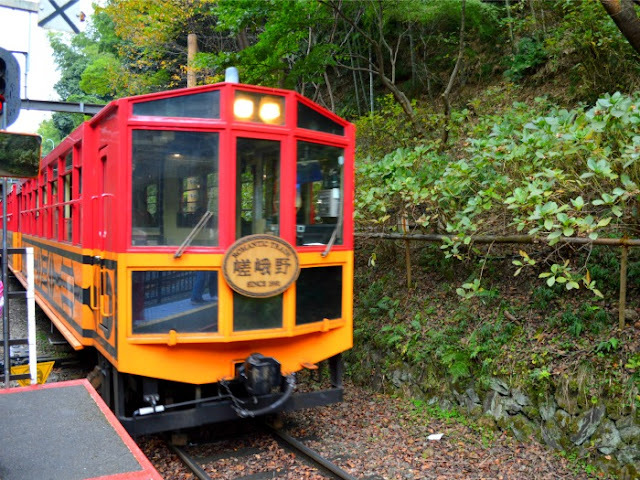 Looks like a great train ride. 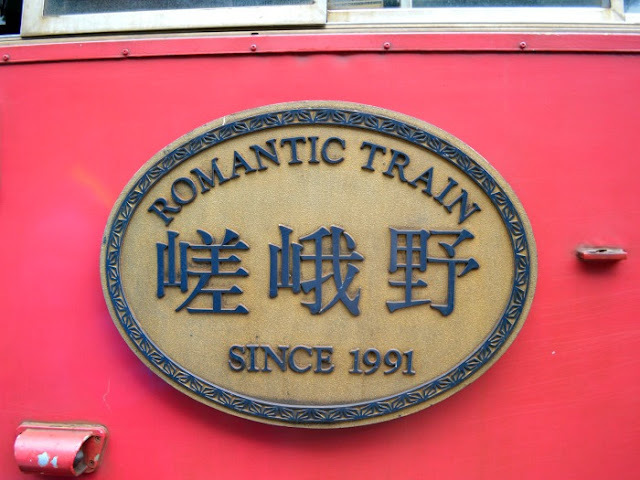 How did it get the name Romantic Train? You know, I'm not sure, but I think taxi's are called something similar too. Yeah, the rain wasn't ideal considering it was open, but luckily we didn't get drenched! Love the vintage/classic look of the train! Yep, it was so cute! Trains always have a special fascination for us. We really had a great time in the Swiss train. Have heard about the Bullet trains of Japan, but the Romantic Train is a revelation to me. The journey looks really romantic and mesmerizing. I work in the railways, so I have a little soft spot for trains too! The bullet trains are amazing and such a convenient way to get around. It was a great way to see another part of the Kyoto region! 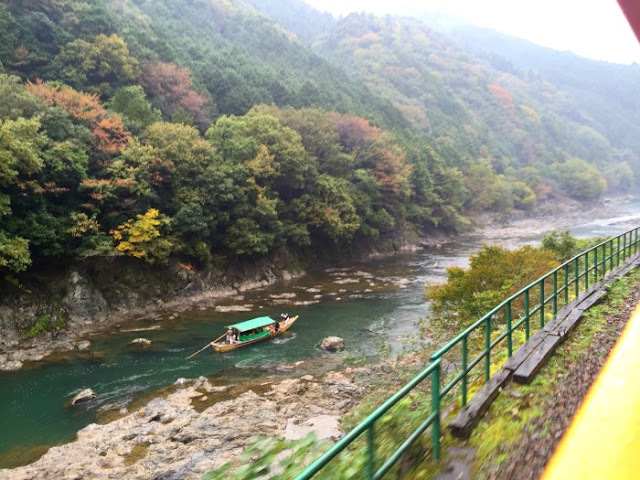 I feel a train ride is so much better than driving when it comes to viewing beautiful scenery! That river is absolutely gorgeous. Exactly! And you don't have to concentrate on the road!